Xerocomus parasiticus (Bull. : Fr.) Quél. Fruitbodies solitary or clustered, attached to fruitbodies of earthballs (Scleroderma citrinum). Cap up to 5 cm, at first hemispherical then convex, straw, ochraceous or brown, sometimes with olivaceous tint, dry, felty to smooth, sometimes finely cracked. 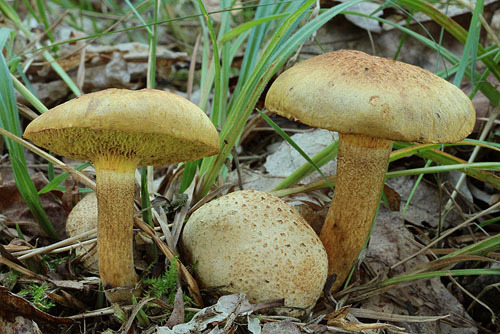 Stipe cylindrical, often curved and usually tapering towards the base, concolorous with the cap or sometimes more rusty coloured, but paler at the base. 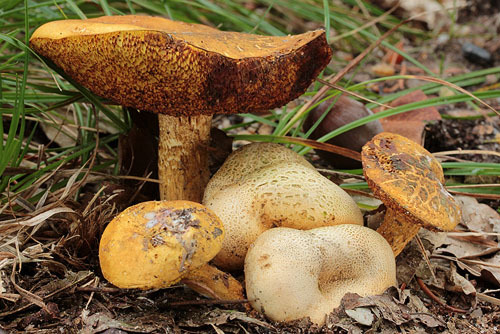 Flesh yellowish, often brownish in the stipe base and under the cuticle, unchanging when exposed to air. 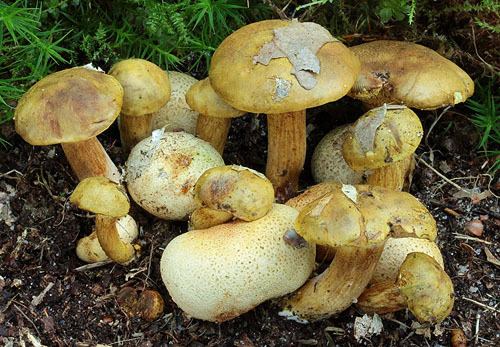 Tubes lemon yellow or ochraceous, sometimes rusty tinted, unchanging when injured. Pores more or less concolorous with the tubes, but often rusty and even reddish when old, unchanging when bruised. Smell not distinctive. Taste not distinctive. Spores 11–20 × 4–6 μm, smooth. Pileipellis (the cap cuticle) a trichodermium of septate hyphae of cylindrical, smooth cells. Habitat. Parasitic on fruitbodies of earthballs (Scleroderma citrinum). Distribution. In Europe relatively widespread, but seldom. Note. 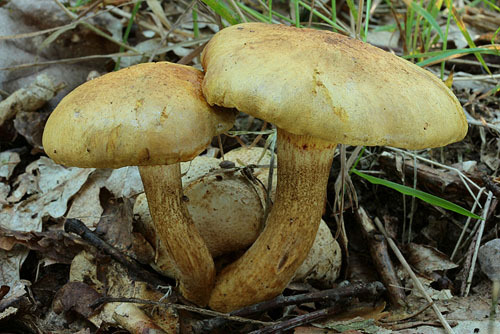 Xerocomus parasiticus is instantly recognized due its unique for the European boletes parasitic habit. 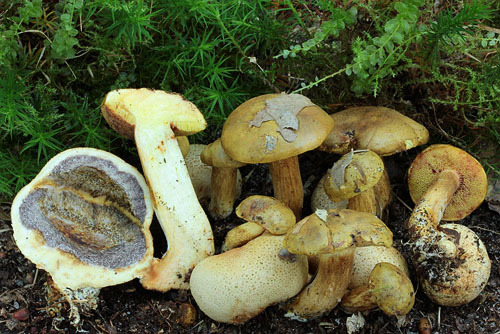 It is sometimes placed in a genus of its own, namely Pseudoboletus. 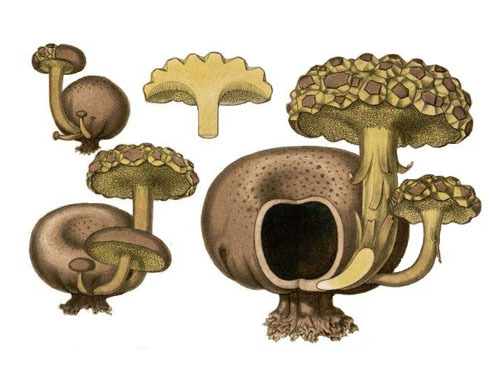 Bulliard's painting of Boletus parasiticus accompanying the original description of this species. Hills, A.E. 2009. The genus Xerocomus. A personal view, with a key to the British species. 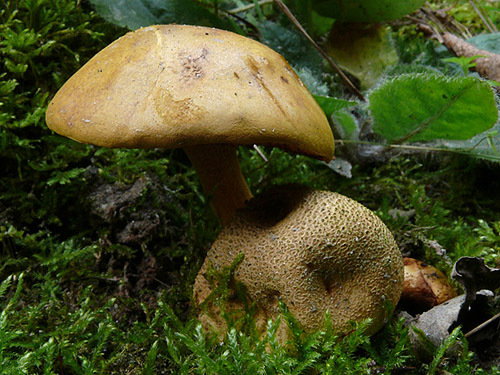 Field Mycology 9(3): 77–96. Šutara, J. 1991. 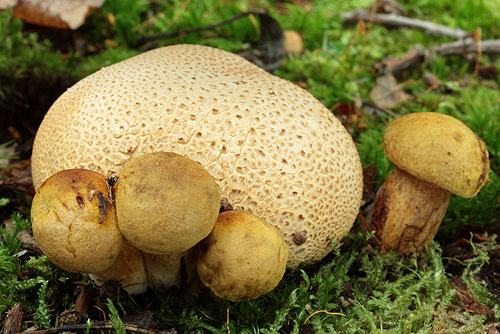 Pseudoboletus, nový rod rádu Boletales. – Ceská Mykologie 45: 1–9.